I may not impact the world, but it's the little things that impact MY world. And most of them are food! I've been sulking about my recent stay in hospital for too long. Yeah, I'm still recovering from having the pacemaker replaced, and I do get stabs of pain from time to time, but I think I'm ready to put a more positive spin on things. And what more delicious way to do that, than to bake a cake! I baked this one while I was recouperating at my mum's house, and had just decided that I had enough strength back in my right arm to put it through its paces and do something besides watch Game of Thrones. 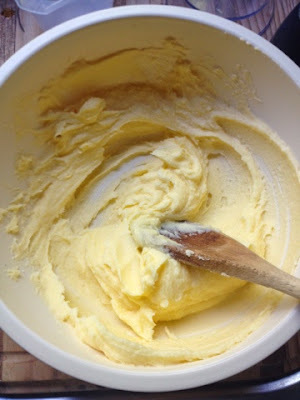 I chose it because I knew we had the ingredients in the cupboard already, and also because I knew it wouldn't actually take a great deal of strength or control in my right arm, as decorating a cake properly would have. This is technically a syrup cake, thanks to the icing, and is magnificently buttery. It keeps quite well for 3 or so days. I say "or so" because I can't remember whether it was three or four, but if I'm honest with myself, I can't imagine that it would have made it far past Day 3 with my mum and I circling like vultures! It's from the Australian Womens Weekly book Bake. Something I'm becoming more mindful of these days is trying to cook new recipes from my multitude of cookbooks, rather than reverting to the same old recipes again and again, and I had never tried this one before. Unfortunately, due to my wikkid skillz in selecting delectable recipes I tend to pick good ones, so I suspect this will become one recipe that I come back to because it was the perfect balance of buttery and tangy. Oh well, I suppose there are more tragic things in this life than cooking the same recipe over and over! A copy of the original recipe can be found here on the AWW website. Note that the recipe on the website tells you to bake it for 40 minutes in a bundt tin. I didn't have a bundt tin available to me at mum's, having relocated it to my new house (have tins: will travel! ), so I baked it in a normal-sized, round tin. I think it was about 8" across, give or take. The supplementary instructions in the margin of the recipe say to cook it in a normal, round tin for about an hour. I think I cooked it for about an hour and five minutes, but as per usual I advocate aiming for five minutes less, testing it for doneness, and then putting it back in. As per usual, I am incapable of sticking to the method. By which I mean, I suffer from the devastating afflctions of having the attention span of a bush fly; a rampant will of my own; and an above-average knowledge of all things baking. I'm that annoying person that sits in front of My Kitchen Rules and shouts "you're doing it wrong!" even if I've only cooked it once before. 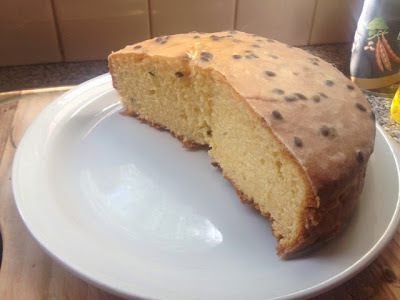 But rest assured that the cake came out wonderfully using my method, although if anyone clicks through and uses the original recipe from start to finish, please email me and tell me how it went! * Note that between the two, it adds up to around one small tin of passionfruit pulp like we get here in Australia. You know the tins that are the same size as tomato paste? Yeah, them. I think I've seen Admiral, Ardmona and John West make them, although I'm sure there are other brands out there. Anyway, this is where I really diverted from the recipe. I was about to pull out mum's Kenwood when I realised that I broke it about a year ago. Well, okay, I didn't break it. It broke itself. I was sitting there, minding my own business, waiting for it to mix something, when it threw a gear. It still functions, but only on super-duper-high-speed, which I thought was a bit extreme for this cake. It's not like I was whipping cream or anything. So I cut the butter into four slabs (if you're playing along in the States, you're looking at around two sticks of butter, so cut them once lengthways), put them in a microwave-safe bowl and microwaved them for about ten or fifteen seconds. The aim here is to make it soft, but not melt it. There was a wee puddle of melted butter in the bottom of the bowl, but it mostly held its form quite well. Next, I dumped the castor sugar in and beat it in with a wooden spoon. I went about as hard and as fast as I could, until it was a bit paler and fluffier in colour. Obviously it wasn't even close to what the mixer could do, but I think considering the fact my pectoral muscle had a hole in it, I did pretty well! Next, I dipped my finger in and ate some butter and sugar to confirm it was stil just as delicious at this stage as it has been the other 12,496 times that I have tried it. Man, I love that part! Then, quick as a wink, I dumped the egg yolks in and mixed them through to prevent me from eating any more of it. It's a pretty good dis-incentive, I have to say. Raw egg grosses me out when I've just seen it (and yet, I happily eat cake batter, not to mention chocolate mousse which has both raw egg yolk and egg white in...go figure). I then alternated adding flour and milk, starting and finishing with flour - flour, milk, flour, milk, flour. I'm not sure why, but I'm pretty sure I remember reading somewhere that it was important, perhaps because you have more control over the moisture? I dunno. Anyway, I guess that kind of became irrelevant here, because you then dump the passionfruit pulp in and stir it until it is mixed in evenly, which really means you have very little control over the moisture content after all! But old habits die hard, and it's good to get into good habits. Next (that's a dirty great lie - I did it first and set them aside, and I suggest you do, too. I like to not muck about once I've added liquid to a product containing a leavening agent, especially if I'm working near a hot stove - you don't want it reacting before you're ready for it to do so) I whipped the egg whites into stiff peaks using the whipping/beating attachment on mum's stick mixer (kind of like a Bamix, but with more accessories). I then gently mixed 1/3-1/2 of the egg white in - I refer to this quantity as the "sacrifical egg white", because, let's face it, the air is going to be squashed out of it by the dense cake mix. But the purpose of mixing it in first is to lighten the batter, so that when you go to fold the rest of it in, it doesn't fall totally flat. Scrape the mixture into the tin, leaving just enough residue to satisfy your ridiculous craving for cake batter (but without affecting your desire to eat the finished product), then put in the preheated oven (my preferred shelf spacing is a little above half way up, so it browns but doesn't burn) and bake for about an hour, give or take. Cake is done when it springs back when touched lightly. Remove from oven, leave to cool in tin for about five minutes and then turn it out right-way-up on a wire rack to cool. Once cool, ice it with the syrup icing. 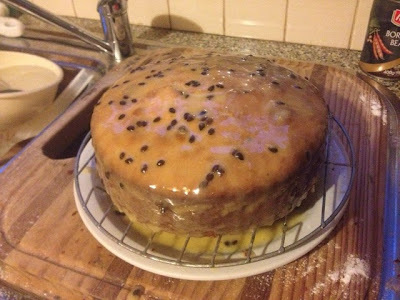 For the syrup, mix the icing sugar and passionfruit pulp together. Microwave (or you could do it in a saucepan) for... uh... I think I did it in 20 second bursts, until it was hot and the sugar was starting to dissolve. I then poured it carefully and evenly over the cake, so that it covered the top and the sides. I also didn't completely melt it, because I wanted it to penetrate but I also wanted it to have a bit of coverage. Look at it, sitting there, glistening with unforetold potential! Anyway, this is what it looked like whole, before I iced it. The above picture were taken at night so they don't really capture the golden-brown perfection of this cake, so I thought I'd throw it in for you. Makes you hungry, doesn't it. And it smelt just as good as it looks while it was baking! And this is what it looked like in the cold light of day. And I can assure you, you will be going back for a second piece. Maybe even a third. No judgement here! 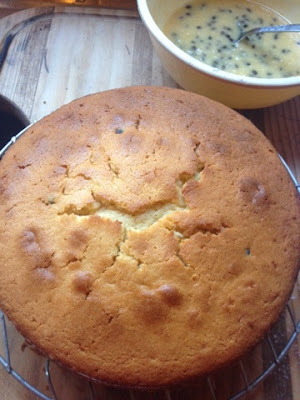 Passionfruit cake is never safe around me. It's simply one of my favourite cake flavours ever along with lemon and orange. Sorry to hear about your hospital stay too. The stabs of pain sound awful, you poor thing! Looks delish! I'll have to try it when Passionfruit are in season here! Glad you are getting your strength back! 100 Days of Awesome: Day Four - I'm Alive! Don't steal my stuff! All text and photos remain the property of the author. If you use it, cite it. Ethereal theme. Theme images by Colonel. Powered by Blogger.